The frame consists of 2 longitudinal side members with welded on to them at the bottom of the front and rear transverse bars . Front and rear spars are attached using the front and rear axles. A complementary transverse stiffness of the frame create upper axis fixed to the upper brackets welded middle spars. Longerons nothing but a closed rectangular tube made of a 2-channel iron beams welded into the end of a continuous seam automatic submerged arc electric welding. At the front ends of front side members welded onto a support with a bore for mounting the front frame axis. 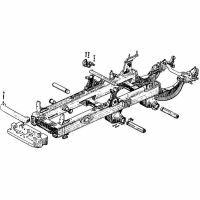 The front axle is fixed in the bores by means of the yoke are pressed to each of the ends of the axle by bolts screwed holes of the front supports. From axial displacement and rotationally front axle is protected by pins and holes molded into the deployed front axle and bearings. On top of the front feet and the ends of the side members welded onto the front brackets. Below the front part of the side members welded onto tow hooks. If you are caring for a desired time frame to check the reliability and whether zatyazheniya fasteners and parts is doubled. The tractor DT-75 chassis has space for mounting agricultural implements, which are side and front of the tractor. For this purpose they arranged vertically and which act over the heatsink flanges of the front frame brackets with unthreaded holes. Venues with four threaded holes provided on the top head frame. In this regard, the tractor DT-75 can be used without training for a variety of s / s of work.